“06880” Party Is A Week Away! The 6th annual “06880″ party is less than a week away. And if you’re reading this, you’re invited. 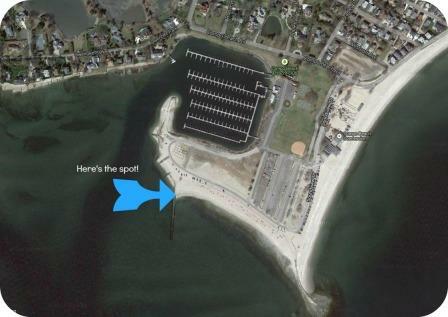 The blue arrow marks the “06880” party spot. The tagline for “06880″ is “Where Westport meets the world.” Next Thursday, that world comes to Compo. Bring your own food, beverages, beach chairs and blankets. (If you bring extras to share with others, we won’t say no). Then mix, mingle and enjoy the evening with the “06880″ crowd. A “blog party” — the “06880” version of a block party. This entry was posted in Beach, Media and tagged "06880" blog party. Bookmark the permalink. Oh, Dan, I wasn’t thinking of your great party when I sent you the pictures of the road clog party the night. Sorry for forgetting. So sorry but, again I will miss the party because I am having eye surgery the day before. One of these summers my husband and I WILL make it to the party. Have fun and raise a glass! For you, we will raise more than one glass! Ratz, I will miss you by 48 hours!